If I were a more talented lyricist then this post would include a humorous baking-inspired cover of Sir-Mix-A-Lot’s famous song, called oh I don’t know something along the lines of “I Like Big Bundts”. It would be amazing. I hope somewhere in the world that exists for the sake of bundt lovers everywhere. But instead there is just this recipe. But it’s a recipe for a bundt that is not messing around. I can not lie. This cake has so much delicious going on. I know you read apple in the title and were like noooooooo, no apple cake for me please, then thought to yourself doesn’t she know that we are firmly into peppermint season now? Well yes, but this cake raises the bar on apple cakes. It is indulgent. It is an overload of goodness. There is crème fraîche and butter and brown sugar and bourbon. And then there is the bundt side of things. 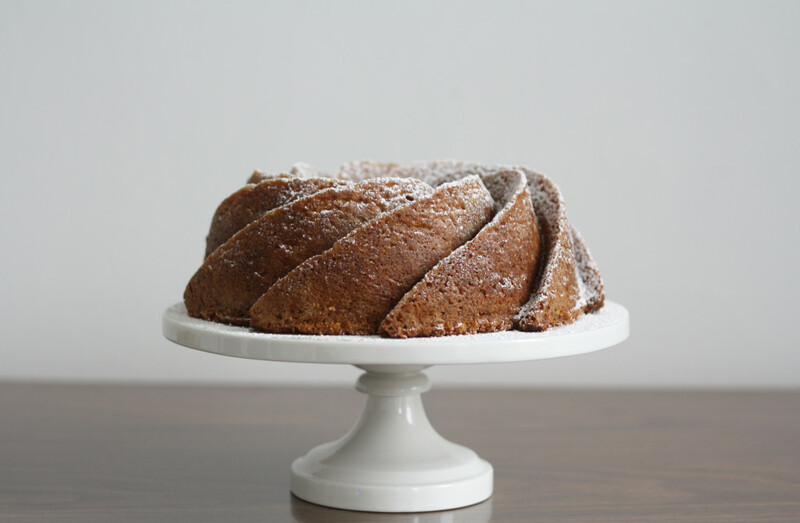 In the same way a tart pan makes anything look fancy, a bundt is a dinner party dessert secret. 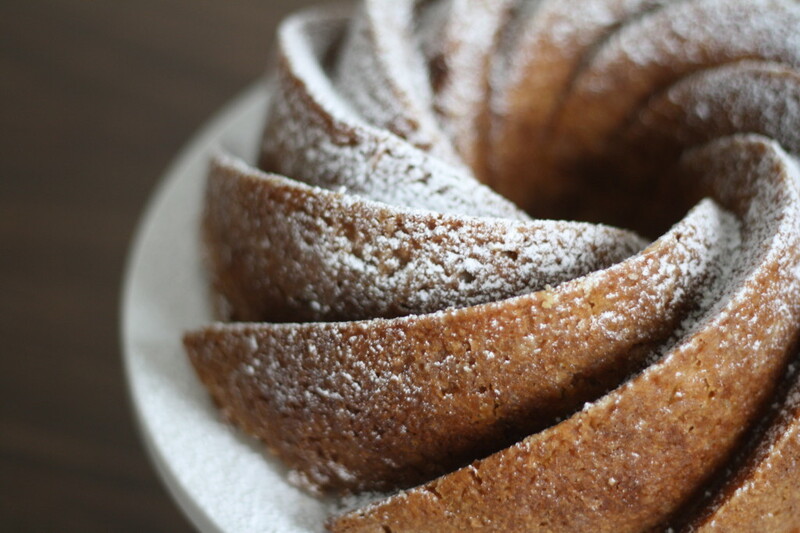 And when you bake it in an extra-fancy swirl bundt – bing! – 10 points get added immediately to your classy score. The other bonus is that this cake works well with whatever variety of apples you happen to have on hand so its a great dessert to bake up when you have a few lonely apples hanging out in the bottom of the crisper drawer. It also is fantastic with just a sprinkling of powdered sugar but it is over-the-top amaze when iced with bourbon buttercream frosting. 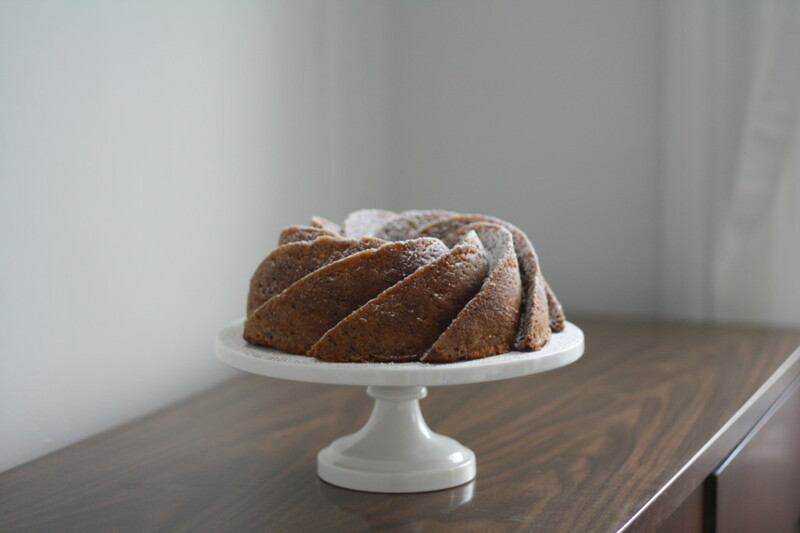 ‘Tis the season for visitors that just so happen to stop by and this bundt will last well-wrapped on the counter for days so it will be ready when you are for the moment the doorbell (or buzzer! – hello apartment living!) rings. Preheat the oven to 325. Generously grease and flour a 12-cup bundt pan and set aside. Do not skip this step or your bundt will not be too pleased when leaving the pan. 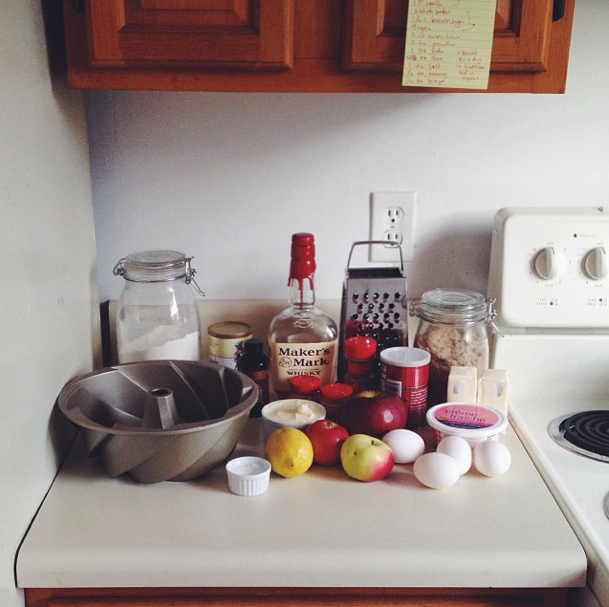 Zest the lemon into a small bowl then whisk in the crème fraîche, bourbon, and vanilla. Next, cut the lemon in half and squeeze the juice into a medium bowl. Peel, core, and grate the apples. Add them to the bowl with the lemon juice and stir a few times to coat (this prevents the apples from browning too much). 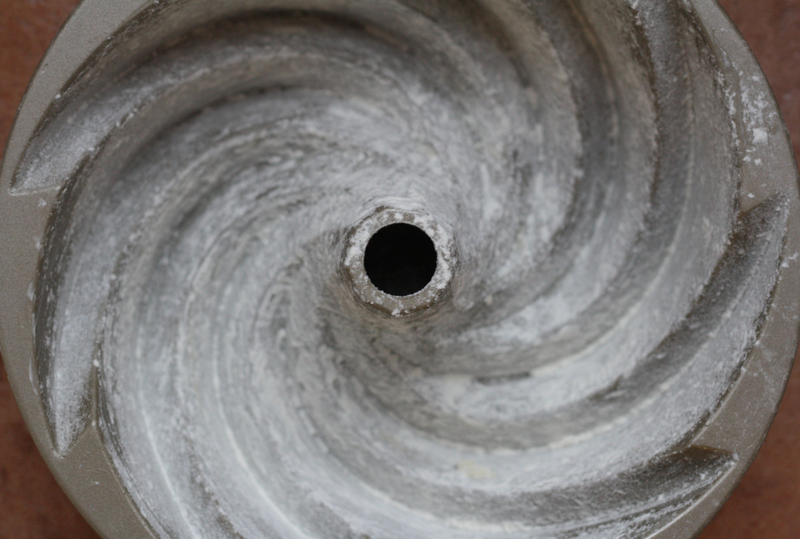 In another medium bowl whisk together flour, baking powder, baking soda, salt and spices. Set all the bowls aside. In a large bowl beat together butter and brown sugar until light and fluffy. Beat in the eggs – one at a time – mixing well after each addition. Alternately add the crème fraîche mixture and the flour mixture to the creamed butter mixture in three additions. Fold in the apples (and any juices) then scrape the batter into the prepared pan. Bake until the cake is golden brown and a skewer inserted into the cake comes out clean or about 1 hour 10 minutes. Cool in the pan for 20 minutes, then turn out onto a wire rack to cool completely. Dust with powered sugar or frost with bourbon buttercream (recipe below). Beat butter in a large bowl until light and fluffy. Add the powdered sugar to the butter – 1/2 cup at a time – beating well after each addition. Add the bourbon, salt and vanilla and beat until smooth and spreadable, or about one minute more. This cake definitely raises the bar for apple cakes! It’s beautiful! How do you get it to come out of the mould so perfectly shaped? Is there a knack? Thank you! Yes, I do have a few tricks. The first is to really butter and flour your pan, even if the cake is nonstick. The second is to let the cake sit in the pan for 30 minutes before trying to unmold it. You don’t want to flip out a hot cake or cold cake. It will come out best when warm. When my cake is done and I remove it from the oven and usually set a timer for 30 minutes so I don’t forget to unmold it. Hope this helps! Happy bundt baking! Such a beautiful cake! 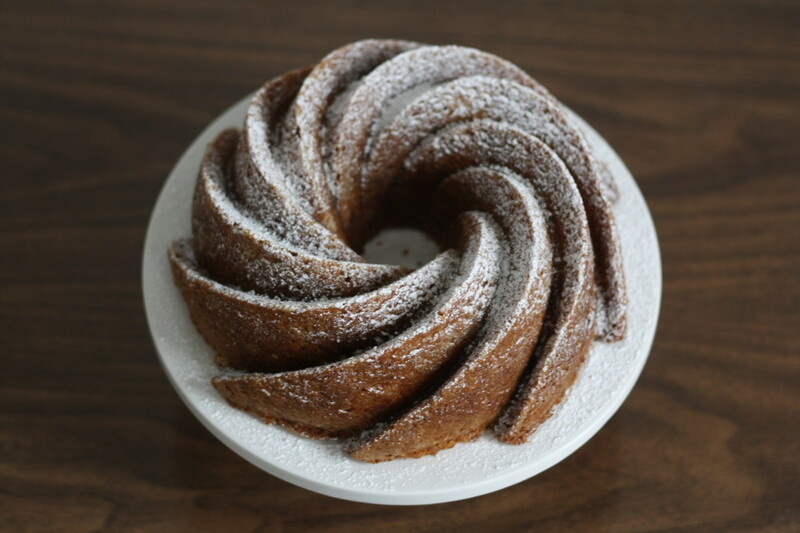 I always love the simplicity of a perfect bundt. What a beauty of a cake. This is simply the prettiest bundt! Love it! You put the ingredients in metric! You beauty! I speak as a Brit who finds cups and sticks of butter impossible to work with. PS – the cake looks amazing too btw. Looks and sounds great, BUT . . . Please instruct me as to how one could possibly apply icing to this cake if using a swirl bundt pan? I was never a Bundt fan until that particular pan. How gorgeous is that cake.? I keep dropping hints…Santa? Loved making this so much! One of your best thus far! Would you like to bake therein? I always wonder about recipes like this, with just a small amount of liquor in the batter and none used for infusing or icing… can you actually taste the bourbon in the baked cake? this is the prettiest bundt cake eva. and with sir mix a lot being from our same alma mater quite appropriate!! This cake was amazing! So moist and perfect, with just the right amount of savory/sweet goodness, I am glad you shared the recipe. I met your friend Hunter here in Seattle, and he told me about your website, and I am very glad he did. These recipes are great, and I cannot wait to try the other ones.